Look at the Daily Star front page photo above. 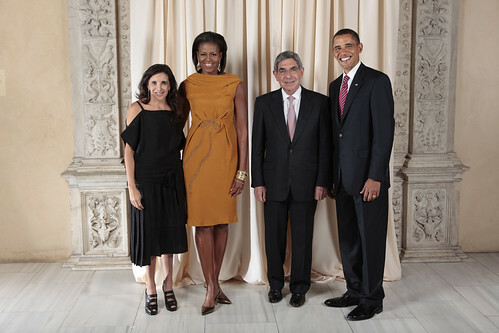 You will see someone’s photo has been cropped out from next to Michelle Obama. Now we have two question to our readers. 1. Whose photo was cropped out? Same “person” who was occupying front seat of Bangladeshi delegation in UNGA. There was already criticism why and in what capacity that “person” was occupying front seat in UNGA. Daily star is just trying to help minimizing these criticisms for Awami League regime by giving selective news. Ha ha ha ha ha !! How about REFORMING the motherland, wasnt that the whole object of 1971 ?? Destroy the WB ? oh no !! – then where will our $1.2 billion of funding (juicy graft & corruption source) come from ? Keep the WB, but make it easy money, no anti-corruption threats !! The irony is PM asking WB to reform, when NO reform was done on Bdesh past 3 years, is pot calling kettle black. Maybe thats why WB is reforming BD’s corruption ! why this is remotely problematic? Michelle is there no? i understand why Kgazi, Idune would find it problematic. They are viciously anti-awami league. But I thought JR claimed Rumi is logical anti-awami league. I though t I was visciously logical ! Michelle is the First lady of USA. I would like to know what is Putul’s designation. And also if there is no problem, why did DS crop her out of the picture????? DS cropped her pic so that we can have this discussion.I am sure Hasina did not ask them to crop it 🙂 All I know she may see this a conspiracy of DS to kill her daughter! Putul does not have any official designation but she is the Prime Minister’s daughter. Like Chelsey Clinton or Obama daughters travels around the globe with her parents- or Obama’s dog get to meet with Aung Sang – our Putul also got to attend a dinner with the American President. Now move on and find a next thing to debate to digest your today calorie intake. Putul not only posed for the camera, she also attended the official UN council meeting! I guess, this is not something that can be compared to Obama’s dog meeting Aung Sang!!! Of course, Michelle Apa is there, Barack Dulabhai is there, how dare DS crop the photo ? I don’t ever recall seeing the children of elected leaders with no official or even party credence ever appearing at these formal events. Particularly when they play no ceremonial/figurehead role even nationally. Also, please can those defending her presence please also specify Putul’s official designation?And what she was doing at the UNGA? In 2010 and 2011, the Bangladesh delegation to the UNGA was well over 50 people. In 2010 an estimated 100 and something delegates asked the US Embassy in Dhaka for a visa to attend, as delegates of the GOB, this also included children, distant relatives and other small party people. Can we also ask for a full disclosure of their role at the UNGA and why taxpayer money is used to finance these trips? To be fair, BNP era also saw this type of “why is he/she on that official visit?” The players have changed (maybe intensity went up), basic song remains the same. Where is our third option? Why every time some one points at some major wrongdoings of Awami League Hasina Government, Khujeci has to come and remind BNP did the same. Does it matter? And show me how BNP did the same. Show me the photo of Barak and Michelle Obama along with Khaleda and Coco. Show me the photo of Khaleda ZIa and Tarek Zia sitting side by side in United Nations Assembly. It is customary for the leaders of moronarchies, especially those of little power to make a big scene of being in the presence of actual power. They do this for bragging rights amongst the people they are charged with misleading. This is how we are, whatever political shade. We will know the future has arrived when leadership has more dignity that this. Fariha, actually the key words here are “official” and “ceremonial” — they could provide an out for the PM at least for the photo op. Jefferson was a single father and the role of the first lady was played by her daughter Martha Jefferson. Going down the list of first ladies of the United States, you will find nieces, sisters, and even daughter in laws (Jackson, Van Buren, Cleveland, etc.). But Nehru was actively promoting his daughter Indira (in the public eye) to replace him, (lining up his dynasty). Is there a possible lineage that Hasina is doing the same with Saima, and is that why DS appears to have dropped her ? You cannot recall because you did not even try to find out if they do or not. Someone also took a translator in the 5 seconds photo session. Bangladesh does not have any official first lady. Our Prime Ministers (including the one lasted two years in between and lukewarm criticism from Desi media also took his wife) have taken their children in foreign trips. So did any other Prime Ministers in the region. It is not a Big deal. Big deal is what she said in the summit- debate that. Also, I am sure Putul did a better job than what Munni Shaha did around Hilary Clinton. See at times journalists are more disgraceful than children of our elected politicians. We often ignore that- who would fight journos eh? Why only point fingers at the foot soldiers khujechi? Surely daily stars al-leaning editors owe us an explanation as to why they chose to hide part of the news? Of course they do. Comment about photo editor was tongue in cheek. Hah. Second time pore bujhchi. But to be serious for a second: it’s a classic cropping problem. The giveaway is the blue sari. But to crop that out completely, your crop tool would come up to MO’s hair, which would look very odd. So it could be that he knows how to crop but could not figure out how to do it and not make it look strange. There is also option to use clone tool, but that has it’s own problems. Fire the photo-editor, he avoided taxes for year 1986 !! The purpose of the photo was to introduce the TWO next Nobel winners to the world, and by cropping that objective was missed ! Did the blogger write anything in the post that would suggest that there is something wrong with the presence of Mrs Sayma Wazed in that photo? The blogger does not believe there is anything wrong with her presence in this specific photo op. ( yes her presence at the front row of UN delegate was wrong) . Two questions were asked. Whose photo was cropped out and why daily star would do that.